I have told you before about how much I love post – not the kind that is a bill and is asking for money for things like electricity and telephone bills – but the fun postcard and letters from friends kind. One such exciting letter to get in the postbox is one letting you know there is something too big to fit in the postbox and you need to go and collect it at the post office. Yeeeeeha! I was the lucky recipient of one such amazeballs box of suplise treats from the Gibblet girls in Korea. Just little bit of background, I have known Sandy since the day we were christened together and Kath since she was born. We have been family friends and played Barbie dolls and had water fights and hid in the garden because we didn’t want to leave (that one didn’t work out so well for us – we were in HUGE amounts of trouble). But the Gibblet family is like my second home, so this was an extra special birthday surprise. I firstly need to say I feel incredibly blessed to have some many wonderful people in my life. And secondly thank you to everyone who is just so very amazeballs. Lets get back to the box of treats though. The box was a little worse for wear on the sides but it had made the journey all the way from South Korea to Cape Town. Oh boy oh boy was this filled to the brim with totally awesome stuff. From delicious chocolates to the cutest pair of socks (a couple kissing, left foot a boy, right a girl and sticking out lips so when you wear them they look like they are smooching). I also got a bunch of cool tools, including miniature garden tools (spade and rake), a funky bird spatula, rad cake forks and tea spoons and two sets of cooking chopsticks (these are really long). In the beauty department I found a pair of false lashes, these ridiculous face masks that you need to soak in water and then you put on your face and look something like the crypt keeper and a totally kitsch (but very Korean) owl shaped hand cream thing. But I do have to say that the best items in the suplise box were the laundry items. There is a fantastic hanging thing with clips for all your socks and things, amazing. BUT the winner of winners have to be the laundry bags. Ok you might think I’m a bit nuts but the bags are fantastic, firstly they have a clever way of keeping the zips covered so there is no chance of things escaping the bags and watching over your delicates. They came with 2 square shaped bags of different sizes, but the best of all needs to be the 2 bags for your bras. they are round and have solid edges so nothing is twisted and you really can protect those things that you spend a small fortune on (well I do and the Gibblets do) and take forever to find something that fits nicely. WIN WIN WIN! And to top it all off every single item in the box came with a handwritten note explaining why it was in the box. It was so incredibly thoughtful and well planned and exactly what I love. Helps when people know you really well. 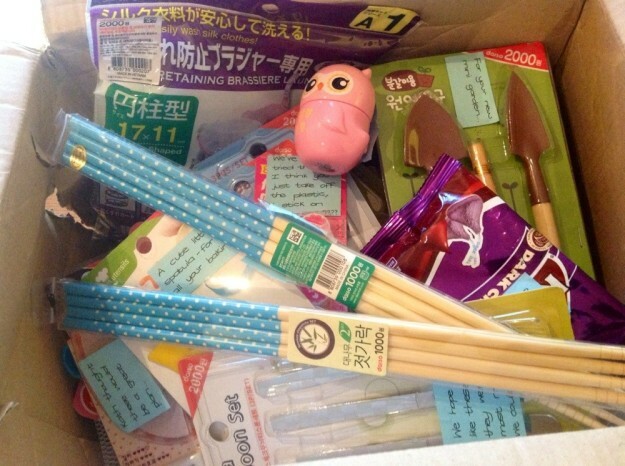 This entry was posted in Luv and tagged birthday, luv, presents, presents from friends, suplise.